The floors of your building, especially those made of hardwood and linoleum, are prone to cosmetic issues such as scratches, marks, and dings. As we've said, your customers will notice such cosmetic issues, as will your employees -- you don't get a second chance to make a first impression. Floor stripping and waxing can keep your floors looking like new, year after year. Quick Brite is Bloomington-Normal's trusted provider of floor stripping services, and we've brought many old, dreary floors back to life in our time. Floor stripping occurs first and is the process of removing old coating that has lost its shine and effectiveness. It is important to remove old coating to ensure successful application of the new coating. Floor waxing is a method of cleaning and polishing floors that not only gives them a renewed shine, but also helps to protect them from more damage. Yes, that's what I need! If the floors have been waxed previously, remnants of the old wax might still be on the floors. You need to get rid of this leftover wax before you apply a new coat. To strip the old wax from the floor, you’ll need some floor stripping products and a floor machine. Wider planks often mean more heartwood which in turn means a greater density and durability. Wider plank floors were also used long ago, as they took less time to put down and utilized the larger old growth timber harvested from the virgin forests of the time. This has given the wide plank floor a timeless look and feel which is enhanced even more so when milled from reclaimed lumber, originally harvested during a similar time. This reclaimed flooring features characteristics such as nail holes, slight surface checking, and insect markings much like that of the old colonial floors. To help you understand what all goes into the floor stripping process, we've put together a detailed list of steps and supplies needed for your average job. Remove all obstacles and furniture from the area. Set up caution/wet floor signs to close off your work area and prevent accidents. Place mats down to remove protective footwear and avoid tracking stripping materials to other parts of the buildings. Now is the time to determine which type of wax was used previously on the floor, and get a floor stripper for that particular kind of wax. Before beginning, you should put on your safety gear – disposable plastic shoe covers or floor stripping protective boots, face masks/respirators, nitrile gloves and safety glasses. Line a mop bucket with a plastic liner -- this will keep the stripper contained and prevent it from entering the bucket area. Doing so also preserves the bucket for future use. Once you've done this, pour the pre-determined stripping solution into your bucket. Consult the label on your product to be certain regarding the recommended mixture. Cover the entire area you've marked off. Apply generous amounts of solution with a mop and let it sit for the recommended dwell time on your product's instruction label. As you'll see below, one of the most common mistakes people make when stripping their own floors is to cut the dwell time short. Do not allow the stripper to dry. Take the specified floor stripping pad and attach it the pad driver on your floor buffer or auto scrubber. 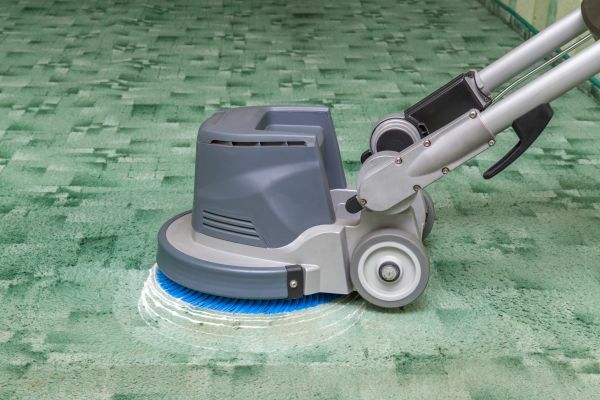 If you are using an auto scrubber, leave the squeegee up and scrub the area once completely before putting the squeegee down and scrubbing again while at the same time, recovering the solution. If you are using a rotary floor scrubber, start in the opposite corner of your walk off mat, and slowly move towards that area. Depending on the age and thickness of the prior coat, you may have to take several passes to completely strip the old wax. Apply the baseboard stripper around the baseboards and let it sit for a few minutes. Use a mop or a swivel utility pad to clean up the wax buildup from the baseboards. Use a mop or a swivel utility pad to remove the wax around the edges of the room. Use the floor machine to scrub the floor. Repeat the process twice to ensure that the previous wax has been completely scrubbed out. Dry the floor with a dry mop or a wet vacuum. Use a fresh mop bucket, or remove the liner from the mop bucket you were using and fill it with clean water. Add 1-2 ounces of floor stripping neutralizer per gallon of water. Mop entire area with the neutralizer. Unfortunately, if the floor is not at a neutral state when applying floor finish, it will not adhere optimally. Rinse the floor one or two more times with just clean water to remove the last of any stripping solutions. While not the most fun part of any job, the clean up stage is crucial. Here is where you must thoroughly rinse and clean out all solution tanks, mops, mop buckets, squeegees and hoses. If the stripping solution or stripped material (otherwise know as slurry) is allowed to sit in the tanks, it can dry or start to solidify and ruin the machinery. Before you are ready to begin waxing your floor it is beneficial to conduct a test to ensure all wax and residue has been removed. There are two ways to check if all the residue has been removed. First, before the floor dries, place a black or dark colored towel on the floor. If white residue appears on the towel this means not all has been removed by the stripper. These areas may need to be treated again. For the second test, allow the floor to dry and then lightly pass a putty knife over the flooring. If any wax if found on the knife, you may need to re-strip these areas. Always wear proper protective gear - You don't win any cool points by forgoing proper equipment. Floor stripper and floor waxes contain harsh chemicals. These chemicals are often harmful for your skin and produce toxic fumes. Always use protective gear like gloves, goggles and masks to protect yourself. Allow for proper ventilation - Before you get started, make sure all the doors, windows and air vents are opened. Ventilation minimizes the risk to your health caused by harsh, toxic chemicals. For large areas, apply strip and wax in sections - Strip and wax each section separately to reduce the chances of you missing a spot or messing up the stripping or waxing process. Cover your buckets with a trash bag - While stripping or waxing your floor, take the bucket you’ll be pouring the stripping and waxing chemicals into and cover it with a trash bag. As we mentioned above, this will preserve your bucket for future use. Moreover, it will make your cleanup process a lot faster and easier. In general, we advise that you use a floor finish stripper that is of the same brand as your regular form of floor wax. It is possible to mix different brands, but you may not quite achieve the results you hoped for. To avoid costly damage or an unanticipated reaction, test the floor stripper on an area of the floor that is not visible to make sure it is right for the purpose and that it doesn’t damage your tiles. Follow the instructions to diluting the floor finish stripper and with a mop, coat the entire area of tile floors lightly. Below, we've listed some of the most popular stripping solutions available today. At Quick Brite, we only use the best of the best. Our floor stripping experts will consult with you before beginning so you know exactly what we're using. SC Johnson's product is lauded for its fast, efficient removal of most water-based polymer floor finishes. It is also well known for its low odor, non-ammonia, non-butyl formulation, which minimizese the disruption to a workplace. Shineline Emulsifier Plus is a high performance stripping compound formulated to quickly remove heavy build-ups and burnished floor finish and enhance the time and labor saving benefits provided through ultra high speed floor care systems. Zep Commercial Heavy-Duty Floor Stripper is an ammonia-free, high-alkaline solution that goes on quickly with a cotton mop or scrubbing machine, then digs deep to remove stubborn finishes and heavy buildup. Its highly-concentrated formula allows it to produce nine gallons of floor stripping solution. Ideal for use on burnished or frequently spray buffed finished resilient and non-resilient floors (except wood, cork and painted surfaces). Low foaming, extra heavy-duty non-ammoniated formula penetrates quickly to remove the finish and dissolve tough buildup. Floor stripping is not easy or for the faint of heart, which is why we recommend that you let the experts at Quick Brite handle the job for you. Below, we've listed the top five most common mistakes by those attempting to strip their own floors. Misidentifying the floor type. The chemicals and equipment used for a VCT floor, for example, may not be appropriate for a stone floor. Improper equipment and signage. The harsh, toxic chemicals used in floor stripping mean you need every bit of the gear we mentioned above. Also, you need to properly close off the area to prevent passersby from entering your workspace. Working in too large a work area. Always section off the floor and work in one area at a time. Not properly diluting the stripper. In most cases, the stripper must be diluted; also, it is often recommended to use cold water. Not allowing for proper dwell time. For those who may want to avoid using harsh and toxic chemicals, there are alternative methods, but they will require more work, time, and effort. If you also want to experiment with alternative methods for floor waxing, you could try a product called paste wax. This inexpensive and easy method can be applied quickly and does not need much time to “cure”, or stick to the floor’s surface. It requires touch-ups from time to time, but is a great way to add shine to the floors without the intense work and cost. An oil-based urethane can be purchased in a gloss, semi-gloss line sheen, or a more matte type sheen which is a muted coverage. Anything containing oil usually requires several coats, and it’s important to remember to allow for drying time in between each coat application. A moisture-based urethane is a bit more heavy duty, lasts a long time, and provides remarkable coverage against scuffs and scratches. It does, however, has a very volatile scent, so it should be used with caution. Traditional wax will give your floors a nice shine and protect them from stains. It does, however, require maintenance including buffing on a fairly regular basis to keep its shine. To maximize the time between floor strips and waxes, you'll want to take proper care of your floor. Below, we've listed a few tips to help minimize wear and tear on treated areas. Take care of spills and messes immediately. If left untreated, they can become a safety hazard and will be much harder to clean later. Place floor mats in high traffic areas, especially spaces which see increased exposure to outdoor elements. These offer great protection to preserve your floor surfaces. Diluting acetone-based fingernail polish remover can be very effective for removing difficult stains on tile or laminate flooring. Not looking for floor stripping services?